Is your garden pond water murky like pea soup instead of sparkling, clear the way it should be? I came up with this simple, fast method for clean pond water without draining it or having to remove the fish. 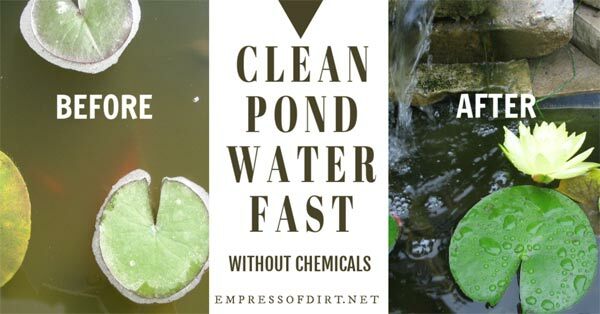 Many pond owners find this chemical-free method will clear the water within hours or days, depending on the size of the pond and how bad the algae is. These tips are part of a series on Backyard Pond Ideas. 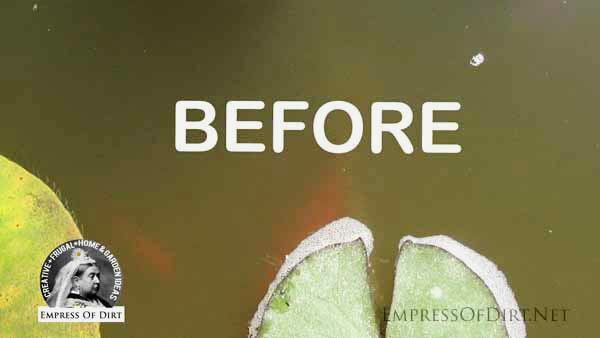 Whether it’s slightly green or thick like pea soup, where you can’t see the bottom and only get glimpses of the fish, this quick cleaning method for pond water may work for you. While, I’ve only tested it on ponds smaller than 1000 gallons, it may work on larger ponds if you have the appropriate strength of recirculating pump and you allow enough time for all of the water to be filtered. In other words, the larger the pond and the grosser the water, the longer it will probably take. 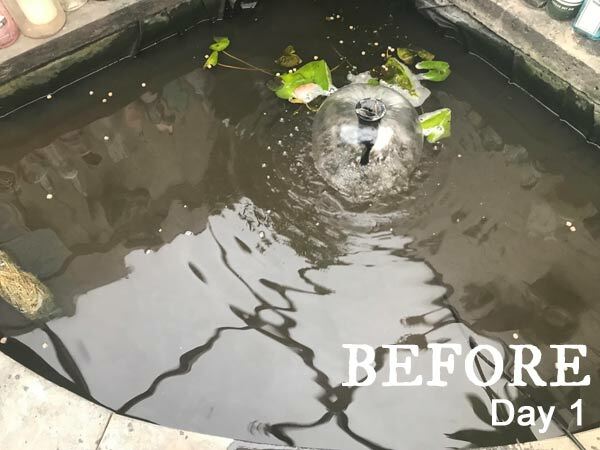 A moderately murky 600-gallon pond will usually become visibly clearer within an hour or two of using this method, and continue to clear after that. Since originally writing this, I’ve heard from numerous larger pond owners and they have said it does take longer (up to several weeks for a really big, murky pond) but, if you stick with it, it works. 3 What Type of Pump Should I Use? Have a look at this short video for a good overview of how this works. Please also read the instructions below to make sure you get the right materials and avoid doing anything that could damage your pond pump. And, please note that you are using these instructions at your own risk. The key ingredient is polyester quilt batting. Do not use cotton: it must be polyester. This stuff comes in flat sheets the size of a bed cover (often rolled up in a bag). It is not loose stuffing; it is all one piece. 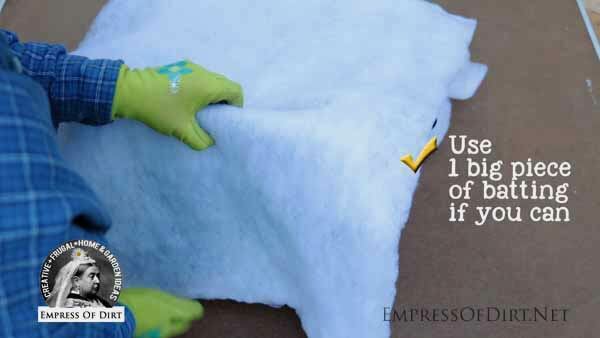 Quilt batting is traditionally used to make quilts and comforters poufy inside. But we will be using it to filter the pond water and collect up all the gunk that is making your pond green. Here’s the quilt batting I use on Amazon.com. If you have Amazon prime, just order one bag. You can always get more if you need it later. The amount needed will depend entirely on how much gunk you have, but one sheet will be cut into piecees to provide several cleaning sessions. Frog Warning: I’ve tried cheaper polyester quilt batting and my pond frogs got stuck in it (their hands/feet would get tangled in the batting and I had to gently hold them and untangle it): please use the Mountain Mist brand or similar quality if you have any wildlife in your pond. What Type of Pump Should I Use? I use basic recirculating pumps in my ponds. I have used several brands and do not have any particular one to recommend. They all seem to do a good job and last several years (year-round use). 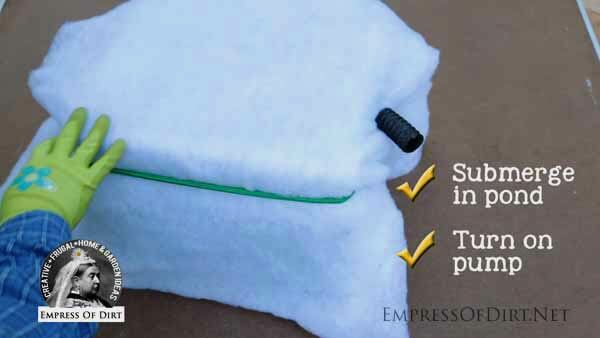 I choose the type that has a sponge-type filter inside that is removable and washable. Once you get a lot of algae, these sponges get clogged with gunk quite rapidly and that’s how the algae builds up: there isn’t anything to filter it out. And that’s how I thought of this idea to use quilt batting. Choose a pump that is the right strength for your pond’s volume of water and allow extra power for any distances the pump has to ‘lift’ the water. Example: A 600-gallon pond with a waterfall that sits 2-feet above the surface of the water. For a pond like this, you may need a pump that moves 750 gallons per hour (gph). If there was not a waterfall, a 600 gph recirculating pump should be fine. If a pump is too powerful, it can cause too much splashing (water loss) and noise. This article on Advice for Starting a New Garden Pond has more information on choosing a pump. If you understand the principle of this method, there are countless ways you could set it up. All we’re doing is running all of your pond water through the quilt batting. Any algae and other thick gunk in the water will be trapped in the batting. When the batting is saturated with gunk, you replace it with a fresh piece and keep going. Do not give up. If you are getting lots of gunk in the batting, it is working. It will take as long as it takes: it all depends on how big your pond is and how much gunk you have. The purpose of this crate is to support the quilt batting while keeping it away from the pump. This will prevent stress on the pump. After setting everything up, the crate is going to be placed underwater in your pond, either on a pond shelf or the bottom of your pond. This is just one way of doing it. Any setup will work that sends the water through the batting (where it collects the gunk/algae) before sending it back to the pond. 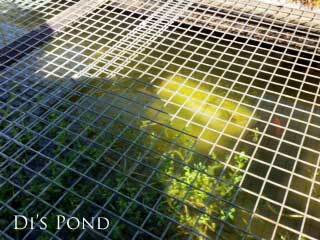 Place the pond pump (this has to be a submersible, recirculating pump made for home garden ponds) in the crate. 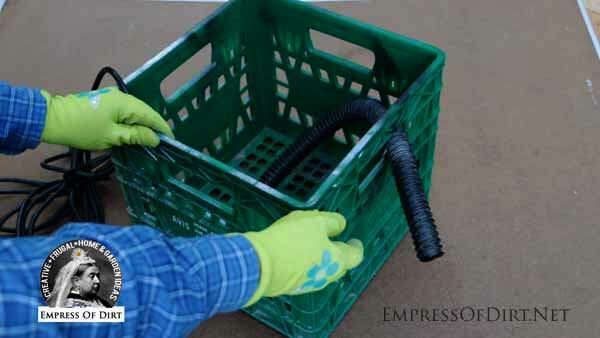 You need a hose attached to the pump to direct the output water to the outside of the crate. Next, wrap the outside of the crate in quilt batting. In this example, I was working with smaller pieces of batting, but do use one large piece if you have it. It’s okay if there is some overlap where you fold it at the corners. 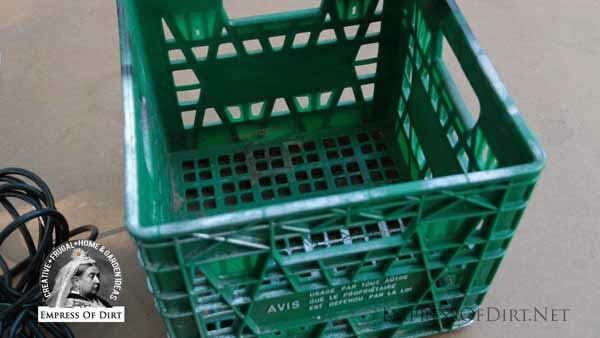 You want batting on every part of the crate where water can get through. I don’t wrap the bottom because it sits flush on the pond floor, but there’s not harm in having there too if it’s easier. Once you submerge this in the pond, the water usually holds the batting in place. You can also add a bungee cord or some nylon rope to also secure it in place. Be sure to position the output water hose so that the filtered water will be sent outside the crate, back into the pond. That’s it for assembly. Now, submerge the entire thing in your pond. You can secure it in place with rocks or bricks as needed. Before you start the pump, take some photos and videos of the murky water. Then, turn on the pump and let the filter do its work. Keep an eye on things to make sure everything is running fine and take photos every half hour or so, or whenever you start noticing an improvement. 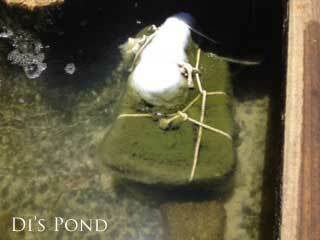 The quilt batting will gradually turn green/brown as it collects up the gunk from the pond water. So long as the pump is working fine without any reduced water flow, the batting is fine. When it becomes obviously saturated in gunk and/or the flow from the output hose is weaker, it’s time to change the batting. How often this needs to happen depends entirely on your pond size, the amount of gunk, the strength of your pump, and the batting used—it could need changing a few times in the first few days or not. As mentioned, I find a small, 600-gallon pond with moderate murkiness can show improvement within an hour or two. Often the water is clear within 4 hours. I hope it’s the same for you. I’ve had lots of emails from people with larger and/or murkier ponds and they say it can take days or even a week but it works. You have to stick with it, keep changing the batting as needed and eventually the water will clear (i.e. you will run out of algae!). If you try this, I’d love to hear how it goes. And if you come up with a smart set up, let us know what you did. I came up with this method many years ago when we could not find a solution for my mom’s murky pond. It was pretty cool when, within a half hour of trying this, her pond finally started to clear and we could see the fish—and the bottom of the pond—again. I have a second pond with a built-in, ground-level skimmer box. For that one, I sandwich a piece of polyester quilt batting between two baking cooling racks (held together with a couple of binder clips) and place it at the entry to the skimmer. This filters any water going toward the pump located in the skimmer box. If you have a small waterfall, it is also possible to setup the quilt batting so that all of the water runs through it on its way back to the pond. I’ve done it by suspending the batting like a small hammock. This will work if your pump is pulling water from the bottom of the pond, ensuring everything gets filtered. 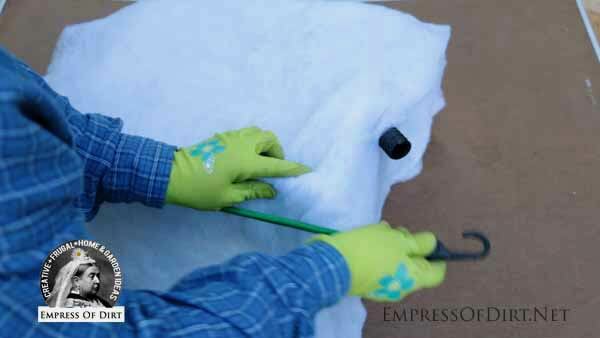 You can continue using the Empress of Dirt batting method and change the batting as needed. Barley straw is an excellent option for filtering the water on an ongoing basis. Barley has properties that inhibit the growth of algae. Do this after the batting method has cleared your water. Bio-balls are also very good for collecting pond gunk. 1 How do you clean out a pond? There’s usually two parts to this. First, there may be algae in the water, making it green and murky. The Empress of Dirt quilt batting method shown above is very effective at removing the algae from many ponds (according to the feedback I’ve received over the past ten years since I first shared this). 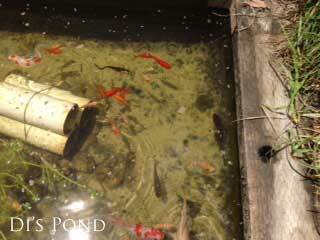 The other problem is often gunk or debris on the bottom of the pond. If you want a sparkling, clean pond, I know this can seem like a problem. Personally, I’ve got so many fish and frogs living in my ponds that I no longer fret about this stuff: it provides necessary habitat for them so I’ve allowed the ponds to naturalize. But, assuming you don’t want the gunk, it’s tricky to get rid of it. The best long-term option is to first remove the fish (to avoid stressing them beyond the move), and then use a submersible vacuum to extract it. This will take several work sessions because each time you do it, it stirs up the gunk, making it hard to see what you’re doing. And get a good pair of waders so you can stand in the pond while you work. If you have the option, draining the pond and starting over gives you a chance to let the gunk dry up and then wet-vac it up. From there, prevention is key. Neither of these are great solutions but that’s because there really isn’t an easy way to do this. I’m sure it’s too late now, but for a future pond: never build a pond under trees that shed leaves. 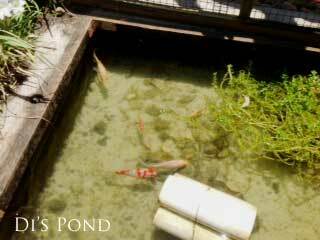 Avoid placing a pond in hot, direct, full sun because that promotes algae growth. Some people try leaf nets in fall, but I’ve never found they work as desired. 2 How do I make my pond water clear naturally? First, do everything you can to prevent leaves and other natural materials from getting in your pond. Next, get a good recirculating pump suitable for the size of pond and amount of water you are sending to any waterfalls or fountains. Then, use barley straw, which is shown to prevent the growth of algae in backyard ponds. If you do see the water going green, use the quilt batting filter method (above) to clear the water. 3 What is the best pond cleaner? I’m very careful with my pond to ensure it is safe for fish and other wildlife including insects and mammals. Good water circulation does a lot to help keep water clear. Also see the suggestions listed in Question 2. 4 How do you clean a muddy pond? See the answers to Question 1 for ways to deal with mud in a pond. 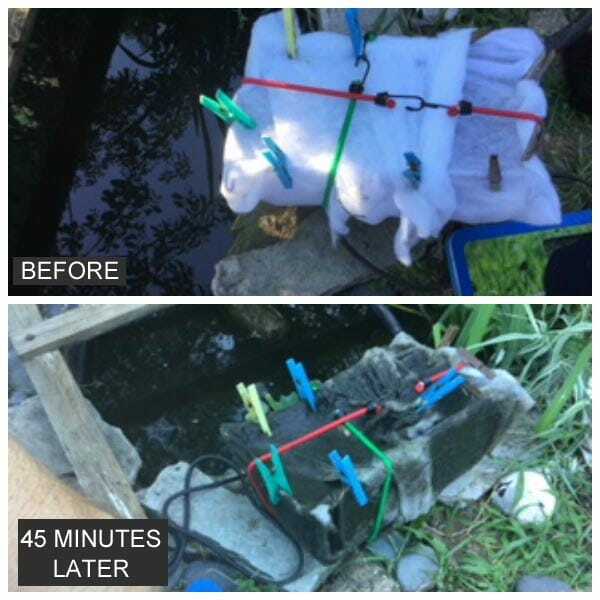 Over the years I have received hundreds of testimonials about this quilt batting method for clearing pond water. I’m actually yet to receive something saying it does not work for anyone who follows the instructions. 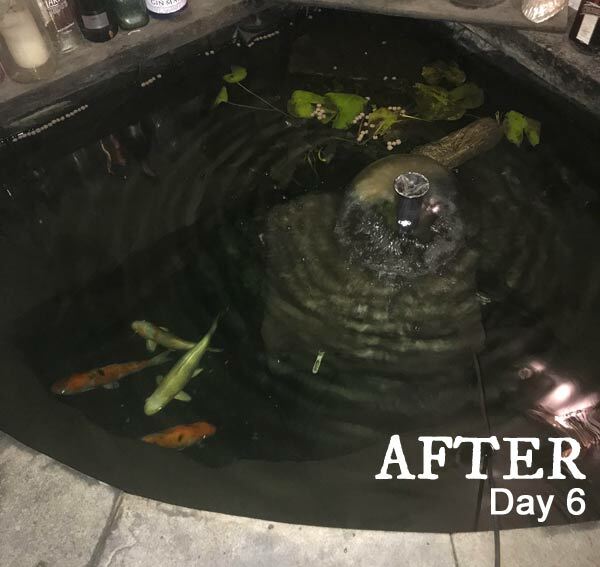 “We tried this in our 1200 gallon pond, and the poly batting worked great! I cut pieces of batting to stick on the backside of our filter in the skimmer. Very easy! At first I was changing the batting every two hours, but eventually the water cleared up. Now I can see the bottom of the pond and all our fish again!” ~J. That’s a lot of muck out of the pond. Hers will take many batting changes before it’s clear. That’s why it’s important not to give up. You’ll get clear water if you allow it to do a thorough job for as long as it takes. Di in Australia recently shared some photos from her pond. It’s 5×7 feet and 9 inches deep. 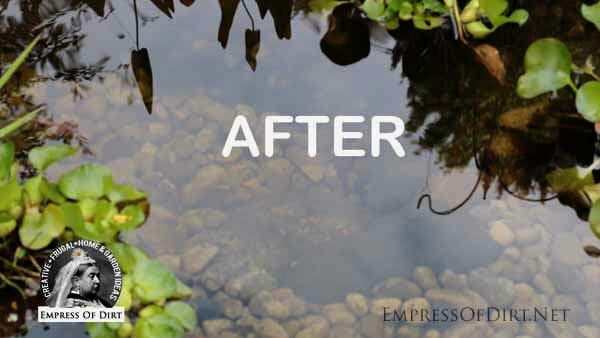 Her pond was loaded with algae and she said it took 12 hours to clear it as shown below. Here’s the pond BEFORE. The pictures are quite small but you can see the green water, some plants, and a hint of a fish below the mesh screen. This next photo is a good example of what the batting looks like when it is saturdated in algae. When the water flow shows any sign of slowing down, it’s time to change the batting. Depending on your situation, this could be hours, days, or months. While there’s still some loose algae, now you can see the bottom of the pond and all of the fish. Di joked that they probably had no idea there were other fish in there with them. Di sent this next photo later, showing that the water continues to clear. Once that algae is cleaned up, you can either keep using some to maintain the clear water, or switch to something like barley straw, which is also good for maintaining it. Thanks for sharing these pictures, Di! Excellent results and happy fish! If you’re new to this, be sure to take photos. Complete guide to indoor seed starting. 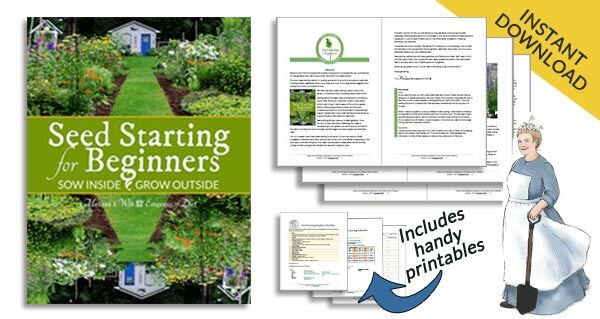 Grow your own garden! Creative, frugal home and (mostly) garden ideas in your inbox! Thank you for your advise on using quilt batting to filter pond algae. Couple of changes of batting material and in 24hrs and our 550gallon pond is crystal clear. Great! Thanks for letting me know. Enjoy your pond! I purchased a small shelf Basket and a roll of Quilt Batt. In 24 hours the pond was crystal Clear. I will change the poly wrap today, and monitor. Thanks for a great idea. I came across your page and tried this method and to my amazement it started to clear up! I’m wondering, can I power wash my dirty quilt batting and reuse it again? I’ve already went through 4 large batting and still trying to get it cleaned, but it’s definitely clearing up! I wanted to say thank you for this suggestion and idea! Hi Joshua, Yes, I’ve had that too where I needed a lot of batting to complete the job and it can get pricey. I’ve tried both washing the batting in a big bucket with dish soap—and **lots** of rinsing afterwards, as well as cleaning it in the washing machine (gentle cycle). Then air drying afterwards. Both worked well enough to reuse it. Worth a try if you don’t mind the extra work. Because I use batting every year, I watch for half price sales at the fabric shop and stock up. Let me know if you try cleaning yours. Hi I’ve suffered from murky water in my 10,000L pond all summer, Ive tried everything to try to clear it with no joy then I watched your video and tried your method and within 24 hours it’s now crystal clear all for under £15 and only took 5 minutues to put togther can’t thank you enough for your video, now my only problem is what koi to buy next. Wow. Great to hear! You must have had that perfect type of algae that the quilt batting is good at grabbing! Thanks for letting me know. And happy koi shopping. Hi! I have a very small pond/water fountain but it is green and murky 🙁 I have the water source currently in a net/bag and have tried the polyester wrap around it but it’s not working for my pond……The milk crate is TOO big for my pump, can you recommend something smaller that will work since the net does not? Hi Kathryn, If it’s very small, why don’t you just empty out the water, clean everything, and begin fresh? 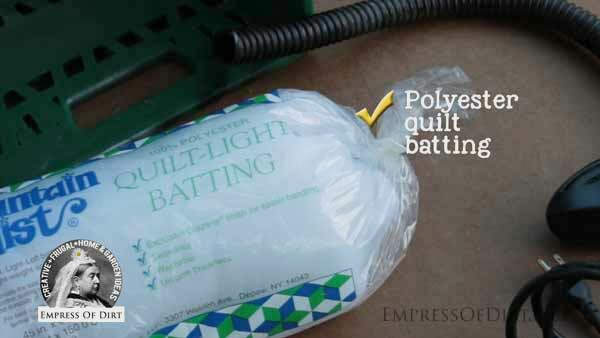 If you’re using quilt batting, you just need to be able to run the water through it. Can be done by hand as well as in a bucket or whatever. Yes! My grandson helped me use the polyester quilt material with great success. After just a few hours, we were able to see the fish again — and later in the day, could even see the bottom of the pool. THANK YOU FOR THE INFORMATION! If you have wildlife in your pond and live in a cold climate, I always recommend owning a second pump as a backup in case the main one fails in cold temperatures (so water is always circulating and frogs and fish don’t freeze). That said, to use this batting method, you can either put the current pump in a cage of batting or use a second pump. The batting is very good at removing algae that’s dispersed in the water. Dirt comes out too but it’s much finer and takes longer. Right now my fish reproduce very often (almost all year around). What would happen to the fry? Would the pump current trap them and kill them? I don’t know but it’s certainly possible. I don’t find fish come up against the quilt batting in my pond but tiny tadpoles or fish eggs might. WHAT CAN YOU DO FOR A COW POND? I don’t want to run a filter forever in the pond and I would have to run several extension cords. Any other ideas? Hi Sue, Sorry, no suggestions here. I just work with small garden ponds with access to an electrical outlet. by the next morning. I am now using it in both pond bio filters. Glad you’re finding the batting to be as efficient as I do. And cheers for a new start with your pond. Hi! I can’t wait to try the “batting filter”. Can I connect the discharge hose from the batting filter to my regular filter or should I not? HI,I did the batting method to clean my pond of murky water and it worked great. When it got clear we removed the crate and it got murky again so we did the process again and it didn’t work the second time. What do we do now? Hi Frances, Is it algae in the water? Is the water green? 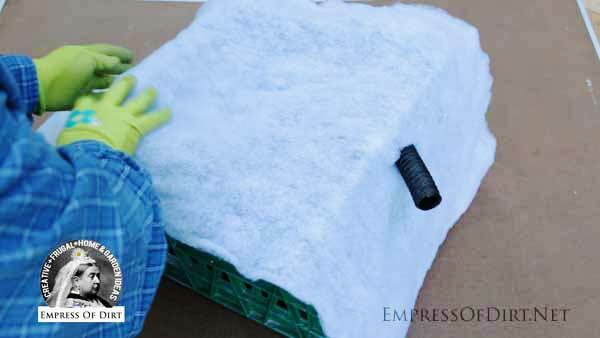 Dear Empress, you ARE amazing and so generous to share this brilliant idea! It has been such a wonderful boon for me and my conscience. I was so reluctant to use the chemicals recommended to me by various pond stores. I kept thinking there had to be a better way, but had no idea how to go about it. Then I stumbled across your website. Now I recommend your website to my friends. THANK YOU Empress! You’re the best. Yes the pond filter media sounds good I’m going to try it. I had to redo my pond liner about 5 years ago. I have struggled to get it clear ever since. My pond is approximately 9’ x 5’x 3’, with 2 pumps. One runs a fountain, the other runs a molded waterfall. I have 18-30 small goldfish. I also have a weeping peach tree that shades 70% of the pond. I was at my whits end when I finally came across your YouTube video. It took about a week, and 4 batting changes, but my pond was crystal clear this morning. I was like a little kid on Christmas morning when I went out to check it. Thank you so much for the advice! I can’t believe how easy and efficient your method is! I came across your article about pea soup pond water a couple of weeks ago by doing a Google search. I was at my wits end with clearing up my pond water. My water was clear since doing our Spring clean-up and then it turned soupy what seemed like overnight. I tried everything–changed the UV light in the filter, added Ecoblast, then added Accuclear, and additional cleanings of my skimmer brushes–and still no change. Then I found your suggestion. As the pond did not clear up in a few days (I think because of the size and the cloudiness), I came back from vacation a week later and found my pond water clear! The polyester batting did the trick. THANK YOU! I will continue to use your method as an additional filtration media. So much cheaper than all the chemicals. I can now see my fish and turtle! I think they are much happier too! Great to hear, thanks for letting me know. And lucky you to have a turtle! Join me as I share creative + frugal home & garden ideas with a dash of humour. Melissa Will is a participant in the Amazon Services LLC Associates Program, an affiliate advertising program designed to provide a means for us to earn fees by linking to Amazon.com and affiliated sites. 1. Grow Avocado from Seed | Easy Method Easy way to grow grocery store avocado from seed. 2. Best Wood to Use for Raised Garden Beds Safe, sustainable, and long-lasting options. 3. How to Make Garden Art Balls Get crafty with bowling balls and more. 4. How to Grow Clematis Cuttings Grow more plants from the ones you have. 6. Best Living Plants for Miniature Gardens These plants are perfect for tiny gardens. 5. Clematis Easy Care Guide Easy 1-2-3 growing guide. 7. 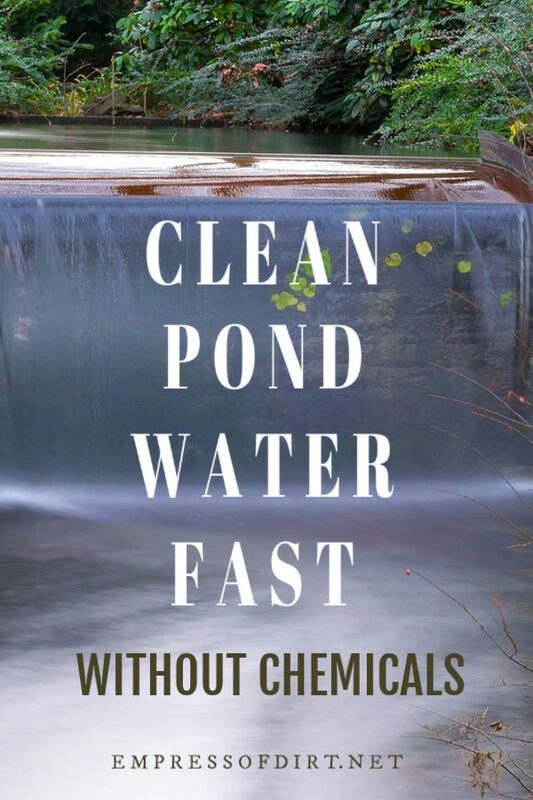 Smart, Chemical-free Way to Clean a Pond Some ponds clear up within hours! 8. Orchids for Beginners My mom (the orchid-whisperer) shares her top tips. 9. Best Glue for Garden Art Projects This stuff works!